This is the fourth article in a ten-part retrospective of the Harry Potter soundtracks. You may wish to refer to the previous entries in the series for more information. So, I’m just going to come right out and say it: of the three John Williams Harry Potter scores, Harry Potter and the Prisoner of Azkaban was the best of them. After the juvenile nature of Stone (music-wise) and the gradually-growing-more-serious nature of Chamber, audiences had grown enough with the character and the franchise for director Alfonso Cuaron’s dark treatment of what was, to date, the most serious of the Potter stories. I think that, when Williams saw just what direction Cuaron had gone with the bulk of the film, he felt it allowed him to make a more adult soundtrack, although it did still have departures from the general feel for the humor sequences. The soundtrack begins with “Lumos (Hedwig’s Theme)”, a much more mature version of the iconic musical phrase. It feels more sinister than ever before, even though that part of the movie is just Harry trying to teach himself lumos maxima. (And why did he never use that spell again, exactly?) And then, with “Apparition on the Train”, we are introduced to the Dementors with music that intensifies their creeping evil-ness. At that point, we still haven’t hit the film’s signature riff, but it’s not a problem. “Buckbeak’s Flight”, which I’ll cover later. The frenetic drumbeats notwithstanding, it’s a great one. “The Werewolf Scene” — great ambiance and use of established themes from within the film. “Saving Buckbeak” — very understated in the beginning, to underscore the need for Harry and Hermione to avoid being seen by anyone once they’ve gone back in time. “The Dementors Converge” — there are two parts to this track; this is the first one, when Harry is trying to fight off the Dementors as they attempt to kill him and Sirius. You hear hints of the patronus theme and the triumphant theme throughout, and when listening to the soundtrack you almost want to go back and hear this one again after you’ve heard “Finale”, just to pick up on what’s happening. “Finale” — and now, the second part, when Harry finally knits together the tenuous logical threads that lead to this point and figures out that he’s the one who has to expecto that patronum all over the clearing to save the souls of himself and his godfather. Williams absolutely nails the triumphant theme with this one in a very understated fashion — just a lone brass and the chorus/synthesized “aaaaaahhhhh” underneath. Then he ends with a reprise of “A Window to the Past”, when Harry says goodbye to Sirius and Buckbeak. “Mischief Managed”, a mega-mix of the entire soundtrack that, in the film, was played over the ending credits. I really like these sorts of tracks. I wasn’t hugely impressed with the gigantic orchestral sting at the end, but otherwise it was cool. Owing possibly to just how heavy the film gets toward the end, there are several humorous sequences throughout, and Williams takes the opportunity to stretch out. “Aunt Marge’s Waltz” perfectly captures the feeling of Harry blowing up his aunt, and the acid-jazz of “The Knight Bus”, while feeling very out-of-place amid the rest of the music, nonetheless fits the moment as it was presented in film (the book didn’t fill the Knight Bus scene with quite as much levity). There’s also “Double Trouble”, which introduces both the Hogwarts chorus and Flitwick’s magical transformation from a gray-haired old wizard to a young-ish bespectacled black-haired wizard. I have no idea why a chorus was included, but there you go. I guess the students of Hogwarts also needed some extracurriculars beyond Quidditch, the Gobstones Club, and Dueling. If the soundtrack has a weak point, it’s “The Whomping Willow and the Snowball Fight”, and only for the latter part. I think it was pretty clear that we were supposed to get a good kick out of Malfoy and his friends being snowed under by an invisible Harry (Emma Watson’s fake hysterical laughter notwithstanding); the music was almost too much. I also didn’t much care for the latter portion of “Secrets of the Castle”, which was too heavy on the higher-register wind instruments. I don’t even remember hearing some of that music in the film; it may have been spread out across several scenes. As for the signature musical phrase in the film, its first major appearance is “Buckbeak’s Flight” (it’s just barely recognizable in “Apparition on the Train” but I don’t really count it because you only catch it at the very end). In the film, you hear it when Harry and Buckbeak hit the air and Harry realizes that he’s not going to die a horrible death by falling. It’s suitably poignant and triumphant, a powerfully-written theme for a film that had more “bad” moments than any of the others. There’s also a secondary signature phrase, first heard in “A Window to the Past”; it’s evocative of Kamin’s theme in the Star Trek: TNG episode “The Inner Light”, mostly because of the wind instruments but also because it gives you a chance to relax and recover amid a pretty heavy series of compositions. And, finally, there’s the occasional use of “Double Trouble”‘s riff, although it’s not strictly Williams’s composition so much as his interpretation in that case. 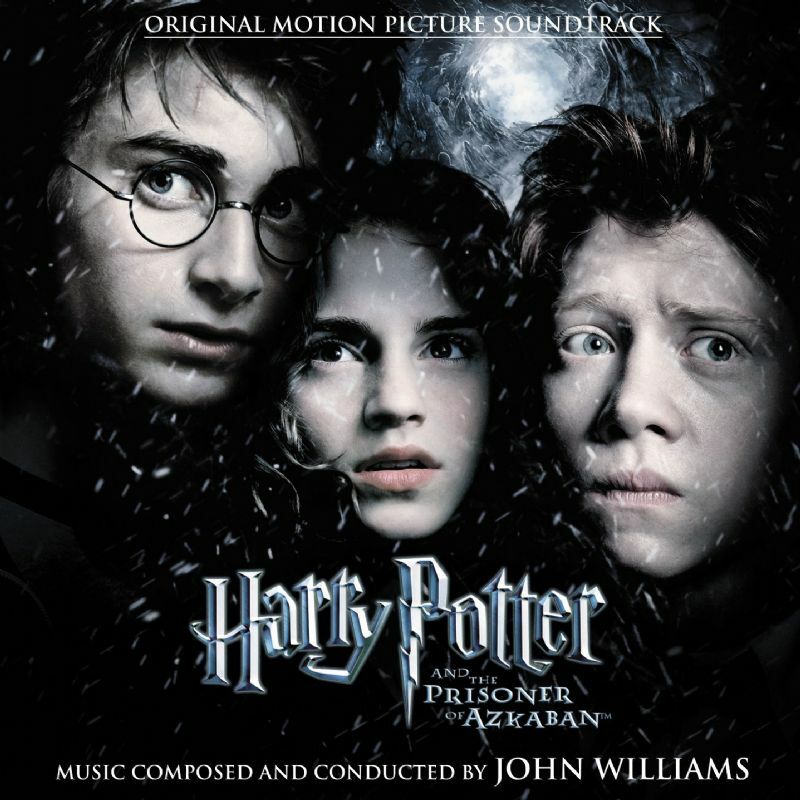 While the Prisoner of Azkaban soundtrack isn’t my overall favorite of the entire series, I definitely mark it as my favorite of the John Williams scores. It’s the most mature, most serious one of his three, and the signature cues he introduces are ones that I find myself humming every now and then. While Stone gave us the main theme of Harry Potter, I think it was Prisoner that really showed us how the music of Harry Potter can make us feel.